The 2012 Mnet Asian Music Awards commenced in Hong Kong on November 30, and Shinhye was honorably invited as one of the award presenters among other Korean and overseas actors/actresses. During her stay in Hong Kong, Shinhye filmed tVn's popular variety show 'Taxi/ with her upcoming drama's male lead Yoon Shi Yeon. The duo toured around Hong Kong, namely the central business area Central, and they also toured around the famous harbor-front in Tsim Sha Tsui, where the merriest and most extravagant display of Christmas decorations are put up every year. 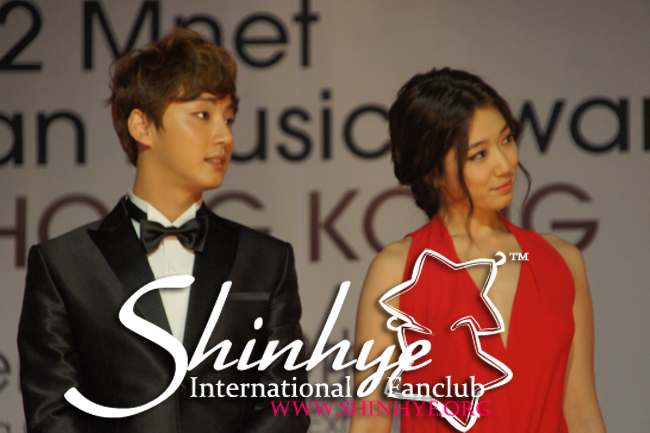 After that, Shinhye got ready for her red carpet schedule, which was also with Yoon Shi Yeon. When she appeared on the red carpet, the audience started swooning because she was the most beautiful goddess ever in the red gown she was wearing, captivating the eyes of everyone in the hall. When asked why she chose the color red, she said because she wanted to be the 'red goddess of beauty'. There a unanimous vote of 'yes' to that wish of hers. Shinhye also mentioned that her new drama will be aired in January through tVn. For the main show, Shinhye and Yoon Shi Yeon presented the award for Most Popular Male Group (to EXO). When they were on stage, fans were screaming again because of her beauty. Yoon Shi Yeon joked that she looked different from 'yesterday's filming'. Shinhye said it was because for her drama's role, she was wearing rags during filming, but at MAMA she was well-dressed for the occasion. Disclaimer: PSHIFC was present at the MAMA as press and thus obtained the official press release photos provided by Mnet. PSH is looking the best in recent years. Beautiful, glowing and elegant. Love the dress. She has not disappeared in it. It's simple and classy. Would love to see her in colors other than red, black and white. She has slimmed down tremendously in past year or so. All is good as long as she retains her fresh and glowing looks as in the above pics. It's not just stunning appearance but everything about her is perfect.......smile, mannerisms, expressions, makeup, hairstyle, shoes, graceful walk etc. she has really come into her own. What I really like is that her dress and hairstyle is her age nothing matronly about it. Excellent representation of Korea on international forum. She is lovely. Thanks for sharing the wonderful pictures. ShinHye is indeed the true epitome of beauty and elegance last night in that simple and beautiful gown. Bias aside, she is the prettiest and the most stunning. Incidentally, Park Shin Hye trended twice worldwide last night, first is when she was walking down the red carpet with YSY and second when they were presenting the award. Amazing girl. Good Luck to FBND...can't wait for January anymore. Yes! the pictures are beautiful......very clear, sharp and I have not seen anywhere else. Shinhye is lovely in each. Waiting for more. Great news about her trending twice......She did standout on both occasions. There are so many sides to her that sometimes it's difficult to assimilate...from TOH.....YB.....HS....RM.....Okinawa.....this! From cute and adorable to stunning, sophisticated young lady. Do hope she remains the same and will not let all the fame and popularity go to her head. absolutely beautiful!!!! that dress absolutely suits her, it's simple but beautiful, just like her. she's becoming a real woman, and i totally agree with the last comment, hope she never forgets her fans and their love for her..
God bless you, Shin Hye, and congratulations for being such a successful actress!!! you are absolutely gorgeous!! why she looks skinny? loss weight? i like her appearance during Peaksang Award...but she still beautiful & elegant..
She looks more and more perfect. Park Shin Hye is the most beautiful and talented Korean actress. She needed to go to the world level. I believe that it will be a great success. she OWNED the WALK of the RED CARPET...PERFECT 10!!! What a wonderful collection of PSH pics from MAMA. So difficult to choose the best among them. She looks great in all. Always glowing, lovely, well-groomed and elegantly stylish. PSH's makeup is always suited to the occasion . Loved this dress in its color and design both. Hairstyle simple and perfectly framing her beautiful face. All in all looking fabulous! She has really slimmed down even further. Waiting for her drama in January. Wish her great success, health and happiness in the new year.